“The Heart of a soldier, with the brain to teach a whole nation"
Some compare him to a modern day Billy the Kid. He considered himself an outlaw, like Billy. In fact, some of his songs verbalize it in the saying: "I'll make you famous." This line is rumored to be a statement that Billy used before dueling. Whether or not he actually used the words or not, the comparison is still there. Tupac Shakur is an American legend. 2pac's short life has a huge impact on anyone who comes in contact with him or his music. Shakur, aptly nicknamed 'Thug Angel,' was raised out of the ghetto, rising to poetic superstardom. Too often his poetry is misunderstood and misquoted. During his career there were even crusades against him and his music by misinformed 'soccer moms' and power hungry congressmen, attempting to censor his storytelling. But his voice and message perservered beyond the persecution in songs like 'Only God Can Judge Me,' 'Keep ya Head Up,' 'Can't C Me' and countless others. 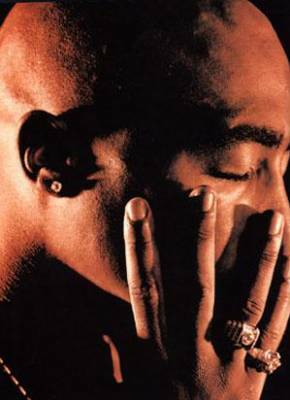 Tupac's poetic rap continues to bring inspiration and hope to the struggles of the inner city. His struggle became a portrait of many of the problems of ghetto life, all for the entire listening public to witness. People loved him wherever he went, but there were people always gunning after him, wanting a piece of him, also like Billy the Kid. There were numerous attempts to end his life, this comes with the territory of being a famous thug. Consequently, he was shot on a several occassions, one which eventually took his life in a Las Vegas hospital. He was not a perfect man, but he was a leader of men. His words still echoe through ghettos and slums across the world. He lived a dangerous life in the new frontier of the inner city. Rising from the ghetto, to become a spokesman for ghetto life, he touched a great multitude of people. Some may still need convincing that Tupac was a great man, but they need only to listen to his music and read his poetry to find a better understanding of his genius. In this age of information, there are still 'concrete roses' that blossom from even the most dire situations. Tupac is an inspiration to millions, they too can come up and represent truth in our modern world. Out of the hardest struggles come the strongest people.